Welcome to a guild about solitaire boardgaming. 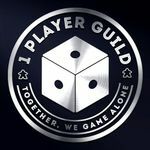 The guild started as a place for fans of the 1 Player Podcast, but quickly became a guild for anybody interested in solo games, whether or not they listen to the podcast. Folks discuss recommendations, trades, ideas and just about anything solitaire related. Come in and make yourself at home. If you are new to the idea of solitaire boardgames and are curious about the subject, here's a great summary: Why do some people play solitaire board games? Finally, here's a word of welcome and friendly reminder: A Friendly Word for New Members of the Guild! A weekly initiative honoring a member of the guild and helping US get to know more about THEM. The initial honoree was the 1PG founder, Albert Hernandez and from that point on each honoree will honor the next honoree with the same honor. A thread is created where you congratulate the SPOTW and ask them questions to draw them out of their solo player shell. To subscribe to be alerted when the next honor is bestowed, visit the Sock Puppet of the Week Subscription Thread. An archive of all the Sock Puppets of the Week can also be found in Albert's Sock Drawer - The Complete 1PG SPOTW List. SGOYT made me buy this! Here are a few links to buy, sell, trade, and gift games within the 1 Player community! Also a link to hot deals from retailers spied by guild members! Solitaire Games - Fair Trade it Forward Part 2 - You claim the currently offered game by simply offering another game in return. You receive your game only if someone claims yours. This page is a wiki. Anyone is welcome to make improvements. The calendar is also a wiki. Anyone is welcome to make improvements. - I love solo gaming! - Solitaire gamer - "Rolling for one"
- Iron SGOYT poster. At least 10 geeklist items posted! - Brass SGOYT poster. At least 25 geeklist items posted! - Copper SGOYT poster. At least 50 geeklist items posted! - Cobalt SGOYT poster. At least 100 geeklist items posted! - Titanium SGOYT poster. At least 250 geeklist items posted! - Silver SGOYT poster. At least 500 geeklist items posted! - Gold SGOYT poster. At least 1000 geeklist items posted! - Platinum SGOYT poster. At least 2500 geeklist items posted! - I'm my own worst enemy, I play multiplayer games solo. There are a few others related to specific games. Search for "solo" or "solitaire". Summary: This calendar can be usd to add important dates for challenges.